Nicholai, a high school senior from Toksook Bay, blends traditional and modern styles in his music to preserve Yup’ik culture and bring it into the mainstream consciousness. 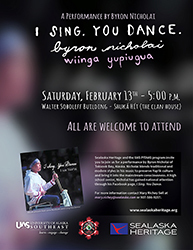 The free event is scheduled at 5pm, Saturday, Feb. 13, in Shuká Hít (the clan house) at the Walter Soboleff Building in Juneau. He also will give a free performance at UAS—that event is scheduled at 7pm, Friday, Feb. 12 in the Egan Library at the Juneau campus. Everyone is welcome to attend. The program is offered through a partnership between SHI and the UAS program PITAAS, which stands for Preparing Indigenous Teachers and Administrators for Alaska Schools.